The total production of groundnuts in South Africa for the 2016/2017 summer agricultural season was about 92 000 tons from 56 000 hectares. The production forecast for the 2017/2018 year shows an intention to plant 65 500 hectares with 53 000 hectares having been planted at the time of writing. Last year’s yield was thus in the order of 1,65 tons per hectare. This average also includes the production from the irrigated areas under groundnuts. The gross margin analysis for dryland production indicates a gross income of R8 202/ha and a direct or variable production cost of about R7 016/ha leaving a margin of R1 186/ha. The corresponding amounts for a yield of 1,5 ton/ha are a gross income of R12 304/ha, with a direct cost of R8 162/ha, reflecting higher fertilisation and labour costs, for a gross margin of R4 142/ha. 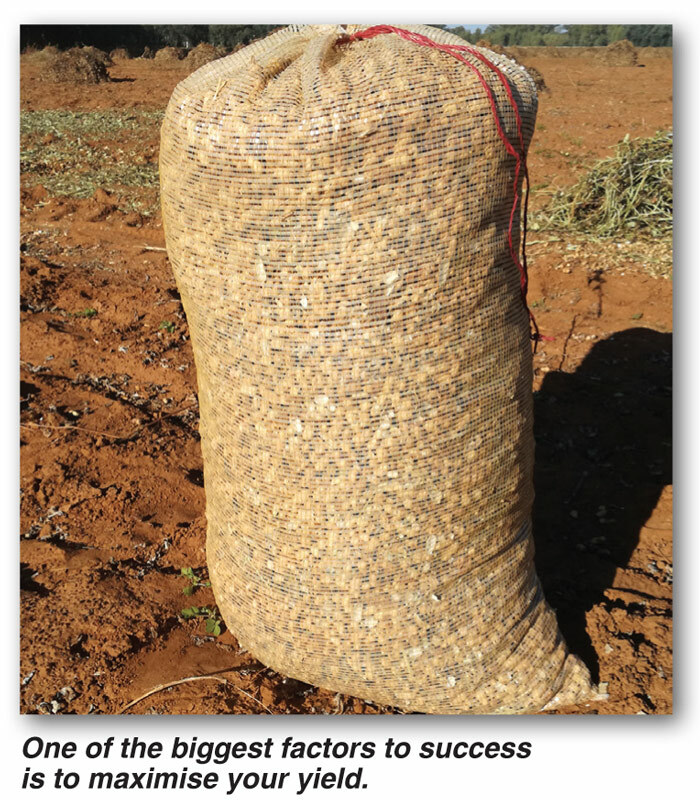 The contribution to the fixed overheads of the dryland groundnut enterprise thus ranges from R1 186/ha to R4 142/ha. Yield potential and targets achieved are thus critical to success. An amount of R1 200 gained from hay sales. Some of the biggest factors to success are thus to maximise yield and to increase the percentage of choice grades from the assumed 55% of total yield if possible. What production practices can be concentrated on to maximise the potential yield after proper pre-planting preparation, planting and during the growth phase of the crop after emergence? It is assumed that the correct soil, with the required high phosphate, calcium levels and pH having been optimised, has been chosen to grow the crop and that well accepted agricultural practices have been followed to the growth stage. The crop is usually grown in a maize/groundnut crop rotation system. All previous plant residues should have been incorporated into the soil prior to planting to reduce the incidences or prevent pod diseases. Keep a journal or file in which records of planting date, cultivar type, seed size and quality, seed treatments given such as rhizobium and other inoculants and additives, soil type, planting depth (50 mm - 75 mm), Intra row spacing (50 mm - 75 mm), inter row spacing (90 cm), soil tests prior to planting, soil moisture conditions at planting, soil temperature which should be above 18°C, rainfall records prior to planting and during the growth phase, planned plant population as recommended e.g. 150 000 plants/ha, actual population, pop up fertilisation if any, growth stages of the crop and any other agronomic aspects that are important to maximising yields. Inspect your crop daily and observe any anomalies that might have to be addressed immediately. Success or failure is determined at planting. It is not recommended to earth up the soil towards the plants. This practice leads to poor peg formation and in turn lowers pod formation. Check for any developing weeds and control these, in time, chemically or mechanically or with a combination of both. Know your weeds and use the advice of your herbicide supplier as to the correct combinations of chemicals to spray. Inspect and monitor the plants for early leafspot which shows as brown spots surrounded by a yellow halo and Sclerotium stem rot which is identified by white fungal growth in the stems, pegs and pods. Both diseases usually occur during high temperatures and moist soil conditions and are difficult to control. Monitor the condition of the leaves to see if any nutrient deficiencies are evident. There are many foliar feeds available that can be sprayed on the plants at the 4 - 6 vegetative (V4-6), reproductive 1 (R1) and reproductive 3 (R3) stages to correct the deficiency in time to still increase yields and the percentage of choice seeds harvested. Harvest when the 75%, or 3 out of 4 pods have reached maturity. Plan in time to do the harvesting by the stacking method with labour or mechanically if this is the usual practice on your farm. For manual harvesting the pods are ready for picking once the pods can be removed from the stems without causing long shreds to form and moisture content of the seeds is about 10%. Study all aspects of the groundnut plant’s growth habits and accepted production methods so that proper monitoring and correct management of the crop during the growth phase can be implemented. Walk through and inspect your crop every day. Article submitted by a retired farmer..